Maintenance of a flare tip beyond small issues like cleaning fuel gas strainers, Inspirators and clearing blocked jets etc… can be problematic due to the height and access restrictions of the location. 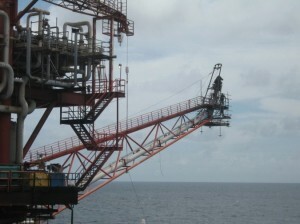 Prior to accessing a flare deck all flare headers have to be isolated (spade off) and purged until free of hydrocarbons. This in itself can take several days to undertake. Flare maintenance however is not an uncommon occurrence. Maintenance and repair for minor damage, is in many cases, seen as the preferred option, when the cost of a Flare tip change-out is taken into consideration. Typical maintenance that is undertaken includes change out of pilot assemblies, repairs and sometimes, the replacement of wind fences / wind shields, through to replacement Ignition and Thermocouple cables. This type of work will likely involve a team of abseilors. Unless winches are set-up, the parts required for repairs as well as the hand tools are difficult to carry up to the flare deck. Weight limits for items “Hand-Balled” up a flare stack, are generally agreed with the operator, and are usually limited to between 30 & 40 kg, depending on local conditions. Hint: to get plant air to the flare deck, consideration could be given to temporary use of a utility gas line. Facilities for maintenance and repair operations, also has to be carefully considered. Will cutting, grinding and welding be available, and if so how will the power and utilities required for the maintenance tasks made available local to the flare. Argo Flares will work with the operators, to help make these decisions, as well as supplying the materials for any remedial work. We understand the complications and issues involved in Flare Tip Maintenance.